Tam says "It gets to be an education chasing these trees down and photographing them as it has taken me to some fantastic spots both from a natural history as well as a historical point of view. Today I found out about a place called Dumfries House (which by the way is in Ayrshire not Dumfries and Galloway). 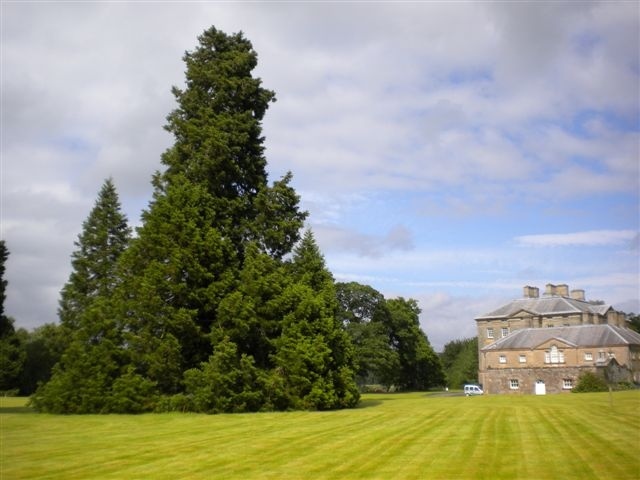 It was designed and built by the Adam brothers (Robert and John) for the Fifth Earl of Dumfries in 1758. 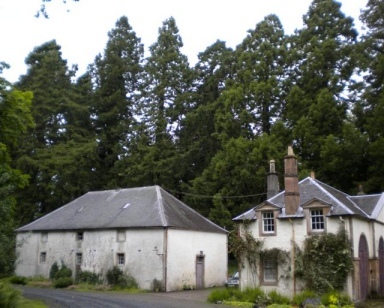 The estate was 1000s of acres in size and stretched for miles around the Ayrshire countryside near the village of Cumnock. 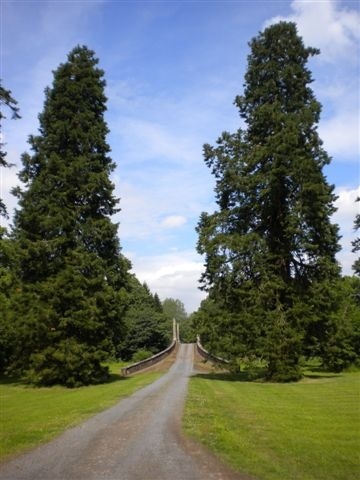 All that aside I found two separate avenues of sequoias at different ends of the estate, at first I did not know these were connected in any way to Dumfries House. At one end of the estate is a farm called Hill farm (grid ref NS540200). Leading up to the farm from the main A70 trunk road there are about 25 Giant Sequoias. P.S. From a distance on one of the main routes near here I could see another lot of Giant's but I could not locate them, I now believe they are in the middle of this estate which is to be open to the public from next year (I can't wait)." Tam also told us of some interesting links " Check these links out 1 2 seemingly this house and estate has been in the news recently!!." I have found the same thing, Tam, it is not only the search and discovery of these magnificent trees, part of the fun is the fantastic locations and the historical education accumulated along the way! "These photos are from the Gatehouse which originally led into the estate known as "Dumfries House". 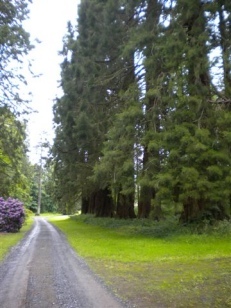 There is an avenue of 13 trees of substantial size the first tree is shown in the trunk photo. The Old chap who owns the gatehouse now also has the trees in his garden he was very friendly and it was he who let me know what the connection to the estate was. I told him these trees must be about 120-130 yrs old but he thought nearer 500 years (he was too helpful to disappoint, I didn't have the heart to contradict him)." 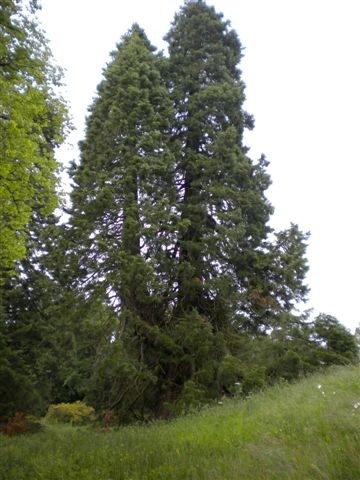 On my travels I have often encountered people claiming a tree to be many hundreds of years old, and yes it often feels kinder not to contradict them, after all a Redwood at 100-years-old can certainly compare in size to many "ordinary" trees of far greater age. In June 2009 Tam visited the estate which is now open to the public. He says, "What a place this is, 1,000 acres of land surrounding the mansion which was one of the Adam Brothers first projects in the 18th century. I didn't have time or the energy to measure all the trees I found only the first 20 odd. Some of the trees I found impossible to measure as they had so many limbs coming out at odd angles. This location will need a good number of other visits to gather all the data, I had a quick count and there are at least another 25 trees to be measured. A good number of the trees i.e. Nos 4-15 were deep in forest cover making height measurement difficult." 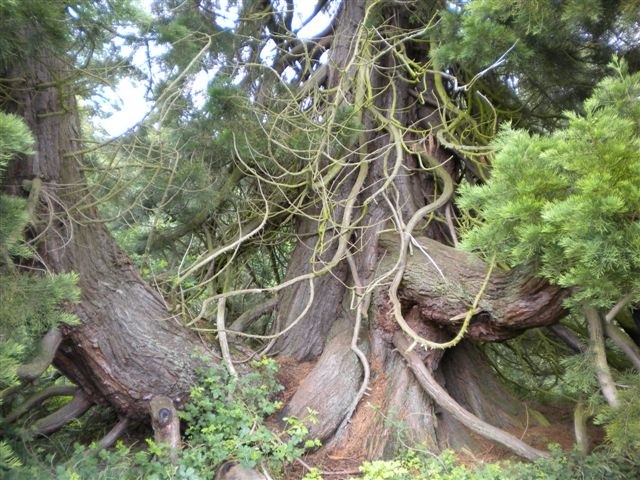 "This tree was huge and had at least 4 limbs growing vertically, it took 66 paces to walk around it. It is situated on the lawn in front of the house and it is a spectacular tree. 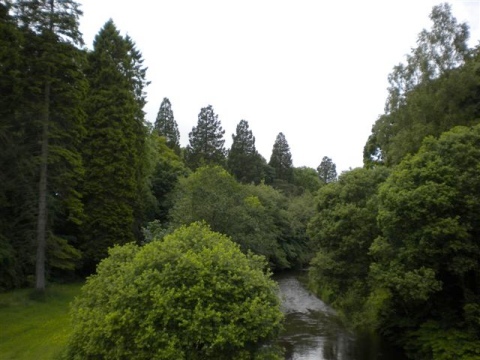 Everything you see beside it is all one tree, even the bit on the left that looks like a 20yr old tree.."
"Sequoias that are in the forest off to the right from the bridge over the River Ayr i.e. Nos 4-15"
"Here are the first two that I measured today on the left is No2 on the right is No1. These are the first two as you cross the bridge over the river." 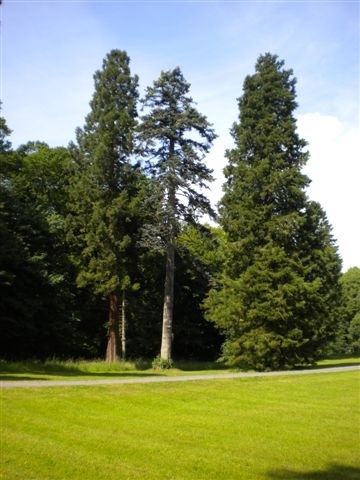 In the second photograph above "Number 3 is on left, a huge Noble fir and number 1 on the right." "No20 was the largest in terms of girth at 9.50m it has three prominent trunks although only two are visible here." "The avenue was at least a dozen trees, Idid not have time to measure or record, in the woods at the side of this including the avenue there are about 25 more trees to be recorded. I will be back here on a sunny day to do so. I've not even had time to mention the house or go into it. There is a cafe as well as a tour which I think you need to book. The stables trees are part of the 25 odd that I did not get time to measure. " Many thanks Tam. You have gathered a grand set of photographs and information on this marvellous location. Redwood No. 23 looks particularly intriguing and it is fairly obvious why it's girth could not be measured! Although at least three of these trees here are worthy of a place on the Tall Tales page in terms of girth, I'm afraid I have to abide by my own rules and "only include trees that we have actually seen and measured ourselves". However, this location is amongst the top of my list to confirm all your measurements on my next visit to Scotland.